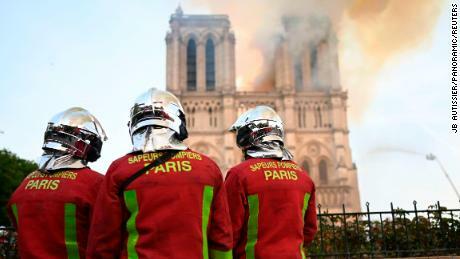 London (CNN Business)French billionaires and companies have pledged over $450 million to help rebuild Paris’ Notre Dame after the cathedral was badly damaged in a fire. The largest donation announced Tuesday was from LVMH Group (LVMHF), which owns Louis Vuitton, Christian Dior and Givenchy. The company and the family of CEO Bernard Arnault promised €200 million ($226 million).The company said in a statement that the donation showed “solidarity with this national tragedy” and that funds would be used to rebuild this “extraordinary cathedral” and symbol of French heritage and unity. LVMH will also make its creative and financial teams available to help with rebuilding and soliciting donations. LVMH chief executive Bernard Arnault pictured in 2018.The Pinault family, which controls French luxury conglomerate Kering (PPRUF), pledged an additional €100 million ($113 million). Kering brands include Gucci and Yves Saint Laurent.Read More”This tragedy is striking all the French people, and beyond that, all those attached to spiritual values,” François-Henri Pinault, the CEO of Kering, said in a statement. 'Notre Dame is our history': France promises to rebuild iconic church after devastating blaze“Faced with this tragedy, everyone wishes to give life back to this jewel of our heritage as soon as possible,” added Pinault, who is the son of the billionaire businessman François Pinault. Total (TOT), a major French oil and gas company, on Tuesday pledged €100 million ($113 million) for Notre Dame’s reconstruction. Tech and consulting firm Capgemini has promised €1 million ($1.1 million). 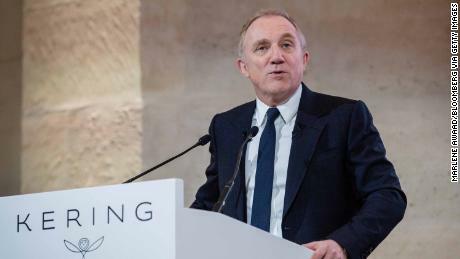 Francois-Henri Pinault, CEO of Kering, speaks during a news conference.The blaze at Notre Dame on Monday devastated large parts of the 850-year-old church, including its iconic spire. The fire was extinguished after nine hours.French President Emmanuel Macron has promised to rebuild the site, saying Monday that France will launch an international fundraising campaign to assist with the effort.Early pledges from some of the richest families in the world could help. 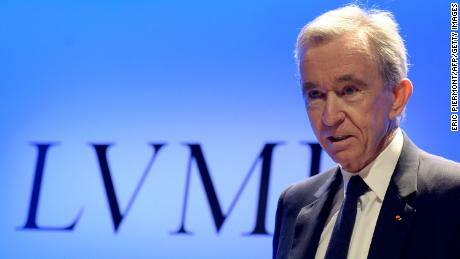 Arnault is the third richest person in the world, according to the Bloomberg Billionaires Index. His net worth comes in at $90.4 billion, more than that of Warren Buffett or Mark Zuckerberg.The Pinault family is worth an estimated $37.3 billion, per Bloomberg. François-Henri Pinault, who manages the family’s businesses, is married to actress Salma Hayek.— CNN’s Saskya Vandoorne contributed reporting.